Do you remember a time in your childhood when you unleashed your true passion? Some do, but many do not. And even more wait until they are adults to have the time and freedom to dedicate to their their own true passion. Unfortunately many children’s passions are suppressed as they are told to focus on something else, based on someone schedules, school agendas or not having supportive encouragement. But what if passion was a part of the learning process from early childhood? What impact would that have on the world? When people are tapped into their passions, they tend to be enthusiastic and proud of the work they do, and often times able to overcome the many obstacles that can arise. 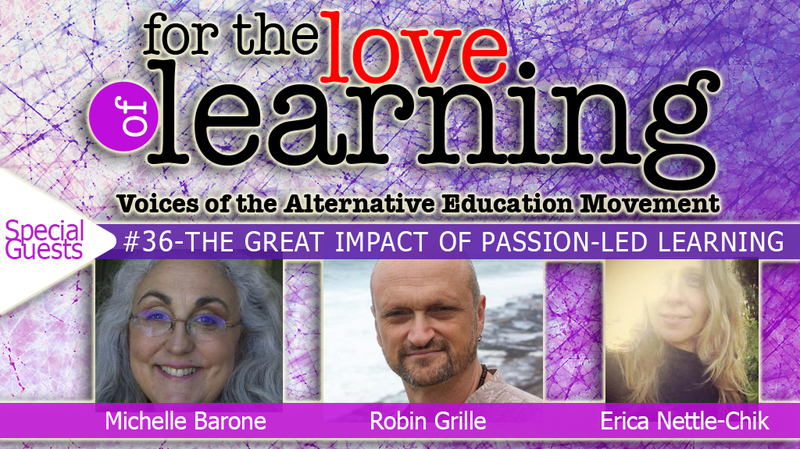 Tonight we will explore the impact of passion-led learning and the many benefits of integrating individual passions into education, every step of the way. Join us for a “passionate” conversation. Erica is the mother of four amazing beings, a partner to a man who inspires me endlessly and a friend to the plants and animals. She has a true passion for truth, beauty and humanity. Erica sees the human being only “Being” such a small percentage of our absolute brilliance and she asks Why? The spiritual journey of conscious motherhood has led Erica down many paths she could have never imagined journeying, questioning things she could have never imagined questioning and finding out truths that have challenged and thrilled her in equal amounts. Erica runs the popular web site and interview series called the Luminous Youth, never knowing where path will lead. Erica is excited to connect with souls who have been kind enough to share their wisdom in this project are bravely creating their own original paths. Michelle Barone is a family therapist, parent educator/natural learning consultant. Michelle is the founder of “The Unschooling Summit” and the “Finding Your Way: Unlimited Possibilities In A Natural Learning Lifestyle” support community. She is also the author of the book, Finding Your Way: Exploring Your Families Educational Journey. Michelle feels so honored to be a guide for people on their life’s journey. She love’s homeschooling/unschooling, watching children blossom and families living a life worth living. She works with adults as they heal and/or transform their life wounds and create the lives they want. She is also a Certified Neuro Emotional Technique practitioner and a Diplomate in Comprehensive Energy Psychology. She weaves her knowledge and experience together to support and facilitate change and growth in mind, body and spirit. Her passion is helping people live in joy and harmony. Normally, when in dialogue with the public I introduce myself as a psychologist, parent-educator and author of two parenting books. That’s the ‘business-card’ approach – and it sounds very adult. Not the complete story. I started life as a child, a baby in fact. Deeper: I started life in my Mum’s womb (at the latest). That’s more relevant than most people realize; because to some extent that is still who I am, why I do what I do and say what I say. I have so many joyous memories of early life, and these nourish and sustain me. However, like many of us today acknowledge, though my family loved me they also f*@#&d me up. There was death, there was migration, there was shattering conflict and upheaval. Wounded people trying to live together in a violent world. Fast forward: I spent many years deep in therapy, primarily group therapy, and this continues to be a commitment and passion. I believe in our collective humanity, our ability to commune, heal and re-create. My work as a psychologist, a father, a writer and speaker springs from and reflects this commitment.